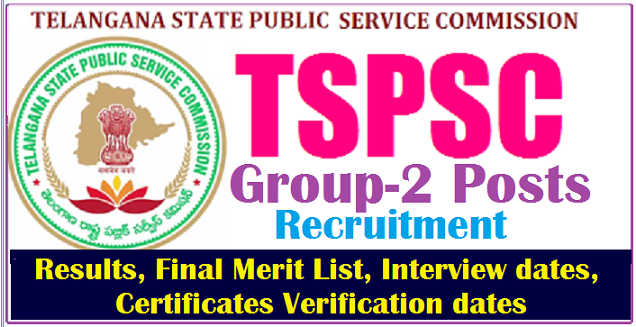 TSPSC.GOV.IN Group 2 Results(Final Merit List) to be declared on 2nd June 2017 : TSPSC Group 2 Posts Results, Final Merit List, Interview dates, Certificates Verification dates 2017: #TSPSC Group 2 Posts Results, Final Keys, Question Papers, #Results 2016-2017, TSPSC Group II Posts results 2016, TSPSC Group II Post details, Municipal Commissioner, ACTO, Sub-Registrar, EO, Excise SI Posts 2016 Recruitment: TSPSC 1032 Group-II Posts Recruitment 2016 Notification Online Applications- Exam date, Hall Tickets download. TSPSC Group 2 exam revised schedule, TSPSC Group 2 Notification 2016 - New Exam Dates Telangana State Public Service Commission (TSPSC),TSPSC Group 2 Posts 2016,TSPSC Group II Post details, Municipal Commissioner, Assistant Commercial Tax Officer (ACTO), Sub-Registrar Gr.II (Registration Sub-Service),Extension Officer (Panchayat Raj and Rural Development Sub Service)/ EO, Prohibition and Excise Sub Inspector (Excise Sub-Service) Excise SI Posts 2016 Recruitment. TSPSC has been released Group 2 Posts 2016 recruitment notification on 1st Septmber 2016 and Online Applications are invited from the eligible candidates for the recruitment of Group 2 Posts in Telangana State. Total 1032 posts Group II exams would be conducted on 11/11/2016 and 13/11/2016 and Online applications would received from 02/09/2016 to 26/09/2016 and Group 2 posts details, Online Application Form, Application/Registration Fee, Eligibility Criteria, Post wise Qualifications, Exam Pattern, Syllabus, Last Date, Recruitment exam date, Hall Tickets, Results and Interview details are available at tspsc official web portal (www.tspsc.gov.in). Dt. 13/11/2016 F.N & A.N. The Examination will be OMR based of objective type. a) Candidates who have already applied for Group-II Services Recruitment pursuant to Notification No. 20/2015, Dt. 30/12/2015 need not apply again. Their applications hold good for this Group-II Supplementary Notification also. b) The applicants who possess the requisite educational qualifications as on 30-12-2015 and eligible in respect of age as on 01-07-2015 as per rules subject to their eligibility and satisfying the terms and conditions of the Notification are also eligible for the vacancies already notified in Notification No.20/2015. c) The applicants who do not possess the requisite educational qualifications as on 30/12/2015 pursuant to Notification No. 20/2015, Dt. 30/12/2015 are not eligible for the vacancies notified vide Notification No. 20/2015, Dt. 30/12/2015. Similarly, Applicants who have not attained the Minimum Age of 18 years and for P.C.No. 3 (Sub-Registrar Gr.II) minimum Age of 20 years as on 01-07-2015 are not eligible for the vacancies notified vide Notification No. 20/2015, Dt. d) Any Candidate who has already applied for Group-II Services pursuant to Notification No. 20/2015, Dt. 30/12/2015, if such Candidate cross the upper age limit of 44 years without any age relaxations and for Pc. No. 05 such candidate who cross 28 years of age without any age relaxations; and also such candidate who cross upper age limit with permissible age relaxations as on 01/07/2016 is not eligible for the vacancies notified now in this supplementary Notification. However, he/she is eligible for the vacancies notified vide Notification No. 20/2015, Dt. 30/12/2015. e) No Candidate shall submit more than one application and candidature of candidates with more than one TSPSC ID will be liable for rejection. The Government of Telangana keeping in view, the actual requirement of man power with reference to the nature of work and activities of the Department and also the overall financial implications, the Government have accorded permission vide G.O. Ms. No. 92 Finance (HRM.VII) Department, Dt. 23/07/2016 for filling up of additional vacancies / vacancies in various categories falling under Group-II Services in addition to the vacancies already notified vide Notification No. 20/2015, Dt. 30/12/2015 vide G.O. Ms. No. 108 Finance (HRM.I) Department, Dt. 27/07/2015. PostCode Name of the Post No. ofvacancies already notified in Notifn. No.20/2015. No. of additional vacancies / vacancies notified now Total Age as on01/07/2016Min. Max. Scale of Pay Rs. 1 Municipal Commissioner Gr.III in (Municipal Administration Sub Service) A Bachelor’s Degree from any recognized University in India established or incorporated by or under Central Act, Provincial Act, a State Act or an Institution recognized by the U.G.C. or an equivalent qualification. 10 Assistant Development Officer in Handlooms & Textiles Must possess a Bachelor’s Degree of a University in India established or incorporated by or under a Central Act, Provincial Act, a State Act or an Institution recognized by the U.G.C. or an equivalent qualification. OR Must possess a Diploma in Textile Technology or a Diploma in Handloom Technology issued by the State Board of Technical Education or an equivalent qualification. 11 Assistant Section Officer GAD(Single Unit) Secretariat Must possess a Bachelor’s Degree from any University in India established or incorporated by or under a Central Act, Provincial Act, a State Act or an Institution recognized by the U.G.C. or an equivalent qualification. 12 Assistant Section Officer in Finance Department Secretariat Must possess a Bachelor’s Degree in Mathematics or Economics or Commerce from any University in India established or incorporated by or under a Central Act, Provincial Act, or a State Act or an Institution recognized by the U.G.C. or an equivalent qualification. 13 Assistant Section Officer in Law Department Secretariat: Must possess a Bachelor’s Degree in Law from any University in India established or incorporated by or under a Central Act, Provincial Act, or a State Act or an Institution recognized by the U.G.C. or an equivalent qualification. Paper-IV TELANGANA MOVEMENT AND STATE FORMATION. #Examination Pattern for TSPSC Group– II . #TSPSC- Syllabus for Group 2 Examinations. 2. Before applying for the posts, candidates shall register themselves as per theOne Time Registration (OTR) through the Official Website of TSPSC. 3. Those who haveregistered in OTR already, shall apply by login to their profile using their TSPSC ID andDate of Birth as provided in OTR. 3)Hall Tickets can be downloaded 07 days before commencement of Examination. 4) The Written Examination is likely to be held on Dt. 11/11/2016 F.N. & A.N. and Dt. 13/11/2016 F.N & A.N. The Examination will be OMR based of objective type. The Date of Submission of online application for Group-II Services (17/2016) is extended upto 26/09/2016. 1. TSPSC Group 2 Results(Final Merit List) to be declared on June 2. 2. Certificates verification should be done in 15 days before conduct of Oral Test/Interview in June 1st week and 2nd week. 3. Candidates should be called for the Oral test/Interview as per 1:2 ratio in July month. 4.About 2100 candidates should be attended for the Interview for 1032 posts.